Living Traditions Presentations is proud to announce its upcoming concert, featuring singer-songwriter Jim Malcolm. Jim will be performing Thursday, November 8, 2007 at 8:00pm in the Zane Grey Ballroom at the Hotel Weatherford. Jim is probably best-known as the lead singer of the popular Scottish band, the Old Blind Dogs. He was their singer for seven years, retiring in August 2006. He is equally known in Scotland as a singer-songwriter and guitar/harmonica player. 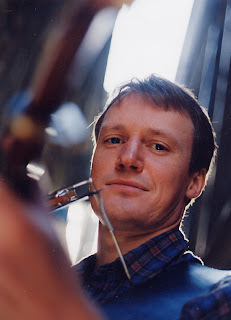 In 2004 , Jim won the Songwriter of the Year award at the Scots Traditional Music Awards. He has been dubbed “the new male voice of Scotland,” being on of the leading songwriters in the traditional idiom. He is also a leading exponent of simultaneous guitar and harmonica, “displaying more talent than many who have made their living from harmonica alone.” If you see Jim Malcolm perform, you can expect to hear traditional songs and ballads, his own compositions, and compelling stories, told both through singing and on their own. He is also a fine interpreter of material by Robert Burns, able to sing comfortably in Scots vernacular. “Given the right song, Jim Malcolm will just melt you in your seat.” – The Scotsman. The concert is taking place in a intimate venue, so tickets are limited. Tickets are only available through Kari Barton, president of Living Traditions Presentations. For tickets, please email Kari@LivingTraditionsPresentations.com or call 928-600-1365. Tickets are $22 with a $2 discount to members of NACHS and FFOTM. Students and Children are $12.